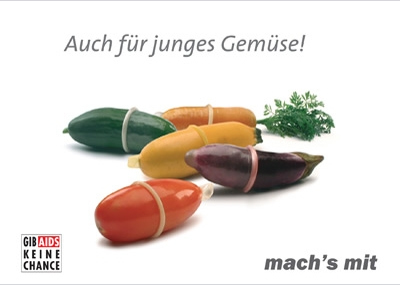 So the German Anti-AIDS campaign is in full swing–and veggies are wearing condoms all over Germany as a part of the “Mach’s Mit” campaign. According to my sources, “Mach’s Mit” roughly translates as “join” or “take part.” Careful search of the website will yield more of the ads from this year’s campaign, advertisements from last year, and… a Pac-Man like game, SafeMan, where you try to swallow condoms! I’ve swallowed a lot of things, but never a condom. nice. i’ll make sure to add that special ingredient the next time i make babaganoush. The “mach’s mit” has been translated a variety of ways by a variety of people. “Do it with” is the sentiment that comes up most frequently. Next time, before I post, I’ll take a poll.